We are a new Benefice which brings together four parishes (with Long Marston only joining in September 2014) which lies in South Warwickshire in the North Cotswold Deanery, partially in the northern area of the Cotswold Area of Outstanding Natural Beauty. All the parish churches were in the county of Gloucestershire until 1931 when they were moved in Warwickshire, after boundary changes. The town of Shakespeare’s birth, Stratford-upon-Avon is 6 miles to the north of the Benefice. This is a rural Benefice with a diversity of population, with many residents commuting into London, Birmingham, Coventry, Gaydon, Warwick and Leamington Spa, amongst others. Agriculture is an important contributor in the region as well as tourism radiating out from Stratford-upon-Avon. There are Primary schools in both Lower Quinton and Welford-on-Avon, with the Senior schools based in Stratford-upon-Avon, Shipston-on-Stour, Alcester and Chipping Campden, over the border in Gloucestershire. All schools are well served by local bus services. As a place to live our Benefice, with the parishes of Long Marston, Quinton, Welford-on-Avon and Weston-on-Avon, offer excellent communication in terms of access to rail and road and bus networks with direct trains to London, Birmingham and Manchester for example from a variety of local stations, with the M5, M40 and M42 all within easy access. From a cultural perspective, nearby Stratford upon Avon is home to the world famous Royal Shakespeare Theatre Company and their new state of the art Theatre Complex, along with the independent Picturehouse cinema. Slightly further afield for those with a love of serious music Birmingham City Centre offers probably the best concert hall acoustics in the United Kingdom, and for theatre the Birmingham Repertory Theatre (next door to the new Birmingham Central Library, which is one of the largest in Europe) offers an interesting program on its multiple stages. 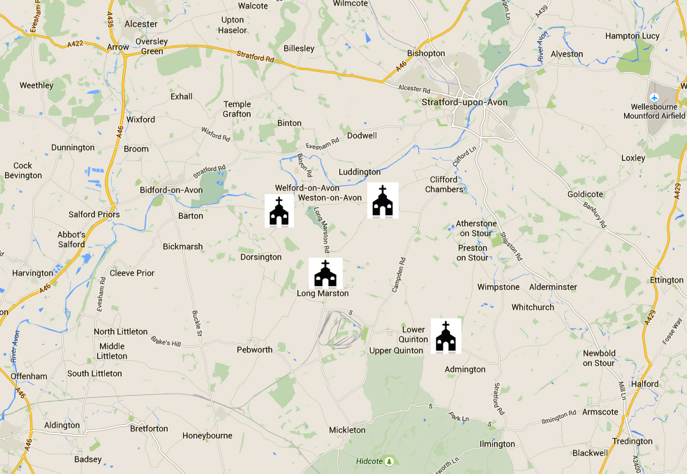 The Benefice is on the edge of the beautiful Cotswolds with an abundance of places to walk. About 5000 people from all age groups live and work here, and there is a wide range of incomes and wealth, which brings its own challenges. We offer a wide variety of service styles, recognising that people feel drawn to worship through different approaches. Services of Holy Communion, Morning Prayer and Evensong, and other approved services, are held throughout the Benefice every Sunday, with united Benefice services on 5th Sundays. Churches also offer other Family Services, Worship Together and other imaginatively themed services. The Benefice has several retired priests who do actively help, with long standing local links, and three Readers, all of whom are resident in the Benefice. A number of lay people have been licensed to administer the chalice at the Eucharist, lead non-Eucharistic services and several deliver the intercessions. Nine have attended a Worship Leaders course. Five trained musicians/organists do a wonderful job week by week in supporting the congregations, or CDs are used otherwise. The two choirmasters co-ordinate the music and combined choir for special services. The 11am at Welford is led by a group of musicians, including piano, flute & guitar. Each of the four parish churches has a pipe organ in reasonable condition which are regularly maintained. Churches from the Benefice send representatives to the Deanery Synod. We have good relations with local churches in the Coventry Diocese, particularly Stratford-upon Avon and Shipston-on-Stour.